It was one of three new bridges built for the Expo, with the other two (Zaha Hadid’s Bridge Pavilion and the Volunteers’ walkway) both being pedestrian-only. While serving its main purpose as an important element of urban infrastructure, the bridge is also a representative symbol of Expo 2008 and its theme “Water and Sustainable Development”. Consistent with the Expo’s sustainable urban renewal agenda, its designer Juan José Arenas, created a suspension bridge without pillars in order to avoid interfering with the natural flow of the river. In this way, its design is an “act of respect” for the river, by at no point coming into contact with the water. The 24,000-tonne concrete bowstring bridge remains a case study in engineering and bridge design for its slenderness and single span, made possible due to its use of high-performance white concrete. Winning a fib Award in 2010 and a Gustave Magnel medal, the bridge has also had a positive impact on the city’s traffic, reducing congestion on neighbouring bridges by 37%. Beyond this, it provides residents with easy pedestrian access to Zaragoza’s high-speed railway station and bus station. 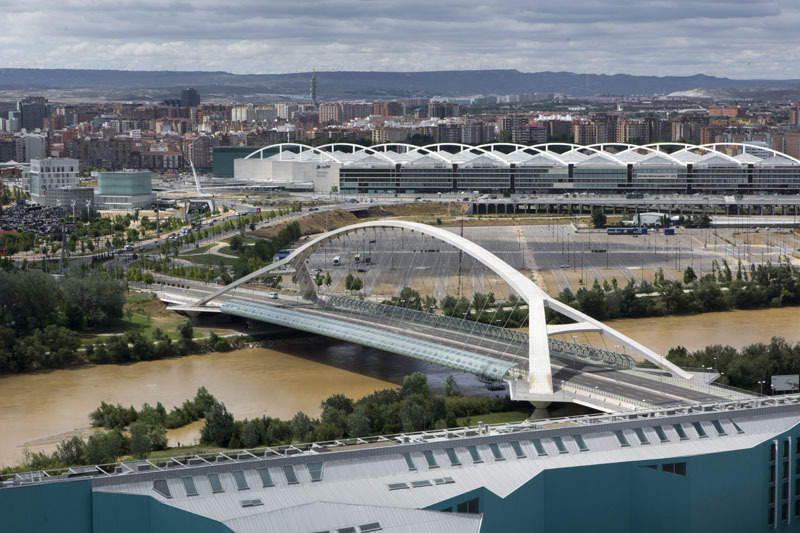 Now at ten years old, the Third Millennium Bridge is still a modern symbol of Zaragoza and a wonder of civil engineering. Having become part of the daily life of the city, the impressive structure forms a key part of Expo 2008’s physical legacy.